The historical town of Vrindavan is flocked with devotees of Lord Krishna. Lord Krishna is present in every house and every shop. About 20,000 people live in Vrindavan and about 2 million pilgrims visit it every year. With the passing of each year Vrindavan faces a challenge of preserving its natural environment. The condition of Vrindavan has been steadily deteriorating over the last 30 years. The Yamuna River’s once sweet and clear waters are now blackened with sewage and industrial wastes. Vrindavan once famous for its forests of Kadamba, Pipal, Tamal, Amalaki and Vata is now almost bare. The few remaining trees around the town are rapidly disappearing in the hands of the unscrupulous developers. The forests which once used to echo with the sounds of various animals and birds now stand in silence. Unable to cope with the monkey population that seems to be moving to the human settlements due to rampant deforestation and urbanization of the state, many people are now looking upon them as a menace to be done away with, putting up electric wires in their homes and mistreating them…Surely this isn’t the fate they could have ever fathomed for themselves. Help a Monkey! We are but all a part of this Creation – Man, animals and the environment, and must learn to peacefully coexist. If our food isn’t theirs to take then their homes are not ours to break. 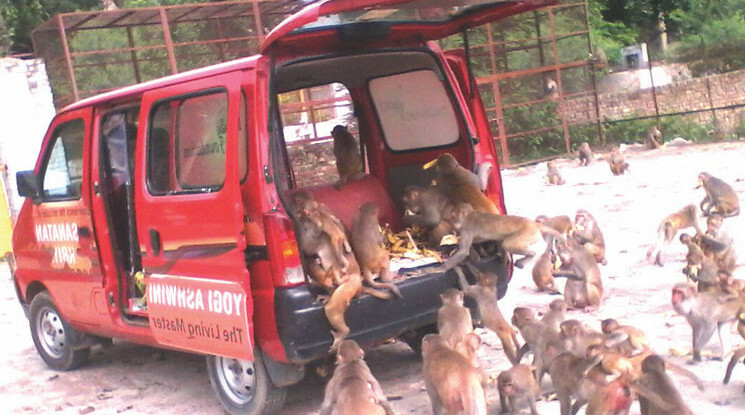 It is in response to such dwindling fates-monkeys going hungry in the holy city of Vrindavan and being put through pain intentionally/unintentionally by many residents and tourists, that Dhyan Foundation volunteers started a daily feeding program. Started on Aug 5, 2014, today we feed close to 450-500 monkeys daily with fruit and cereal, ensuring that the feeding point is away from the urban, populated areas, in an open ground where monkeys flock together. Let us watch our step and do something for the trees and animals, before we reach a point when the only place we get to see them is in pictures.